That guy I posted about being obsessed with? 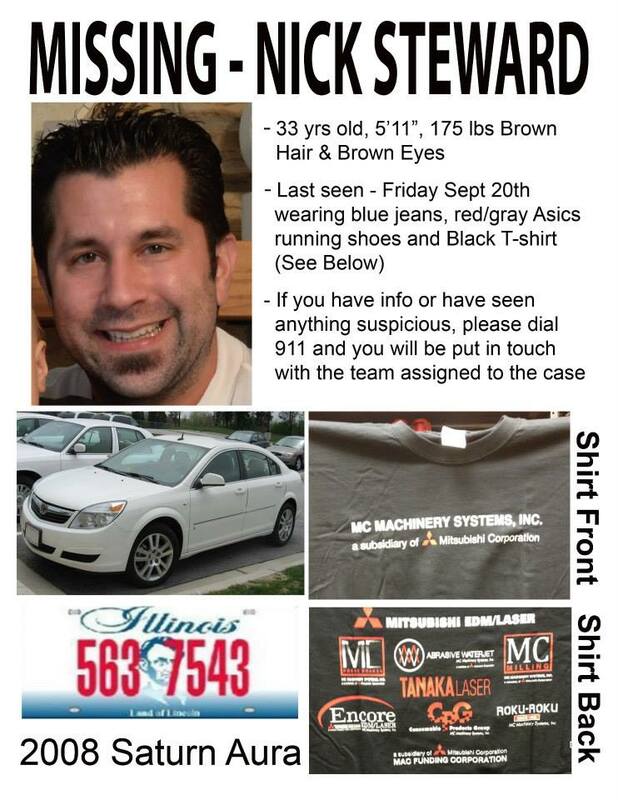 The missing guy from Lake Villa, IL? He’s still missing. Tomorrow will be day 14 of him being … gone. He just vanished. He was coming home from work and never made it home. They haven’t found ANY clues to his whereabouts. Not his car, nothing. It’s crazy and I can’t stop reading about the case. My husband mocks me, telling me I’m living a Lifetime movie because I’m so obsessed with the case. It’s hard not to be, though. He lives in the same town my mom lives in. He’s a new dad. I’ve driven the same roads he’s driven many times. And he’s just … gone. Absolutely no clues have surfaced. It’s bizarre. Of course it doesn’t help–at all–that I started reading Gone Girl before this case surfaced. So my mind was racing with lavish ideas when I heard about Nick’s disappearance. And hello? The guy’s name is Nick, same as the husband in the book. Trippy, right? Only difference is Gone Girl is fiction and the disappearance of Nick Steward is not. And that’s so sad for Nick Steward’s family and friends. Still, I obsess over the case and I can’t help wondering if any of the other people–strangers to Nick Steward–who are constantly thinking about the case, have read Gone Girl. I’m not at all comparing Steward’s disappearance with the missing person case in Gone Girl, but it’s just hard not to think about Gone Girl: It was an amazing read. So wonderfully told. I felt so connected to the characters. I felt like I knew them. Like, they were real people. That doesn’t happen often for me when I’m reading because of the years I spent (college) dissecting the written word. That didn’t happen this time. I was just submerged into the book, into the characters… Wow, I could go on and on about it but won’t because talking about a fiction book and a real missing person just doesn’t sit well with me.